Unlimited sand, waves and shells? That's all the entertainment you need. Drip-dry on your way to the beach. But the kids are up and attempting sunscreen on their own. Time to go inside. Didn't even need the second toss. Iron Chef, it's not - but fun nonetheless. 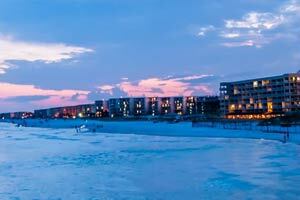 Located on Fort Walton Beach. Island Echos Condominiums by Wyndham Vacation Rentals is located on Fort Walton Beach, where the pace is slow and “real life” suddenly seems very far away. Can’t get a majority vote between the beach and the pool? Divide and conquer. Have the beach lovers grab their buckets, shovels and hats and head for the boardwalk to the beach. Good news! Beach service is included with your stay at Island Echos. Set up camp on a chair and adjust the umbrella for optimal shade. Keep an eye on the kiddos while they build a sandcastle or look for seashells. Pool lovers will love the gulf-front heated pool. Go for a swim or lounge poolside with the book you picked up at the airport gift shop. When it’s time for lunch, fire up the poolside bbq grills. Let the little ones help by carrying burgers, hot dogs, and buns and get ready for a fun family cookout. No time for tennis ’til later? Lighted courts have your back. Spacious individually decorated one- to three-bedroom condos are air-conditioned and have gulf front views. They give you plenty of room to keep things semi-organized, so you can get out the door early for longer days in the sunshine. Take a family field trip to the Tom Thumb convenience store, just a short walk from the resort, to stock your full kitchen. Back in your condo, get in touch with your inner-Betty Crocker and bake up a batch of double chocolate brownies. Have the kids assist with mixing (and taste testing). In-suite entertainment includes a cable TV with DVD player. Collapse each evening in front of a DVD rental you picked up on-site, getting up only to refill the popcorn bowl. Ready to venture beyond the beach umbrella? Ask about kayak rentals and once you pick your turnaround point, race back (winners under age six get a popsicle and extra bedtime story). Curious what kind of wildlife you were paddling over? Hit the nearby Gulfarium and find out. The Gulfarium Marine Adventure Park is one of the world’s oldest marine animal parks and offers several animal encounters. Encounters include dolphins, stingrays, alligators, turtles, seals, penguins, and sea lions. Surprise the kids with a visit to Big Kahuna’s Water and Adventure Park; it offers over forty rides and attractions including slides and pools. The Monkey River slide has twists, and three-hundred-and-sixty degree turns. Challenge one of the big kids to a race down the Kowabunga Slide, or free-fall into darkness on the seventy-foot-long Jumanji slide. Little ones will love the water play areas. - Front desk is open 9:00 AM-5:00 PM daily. Guests arriving after hours may use the late-arrival phone outside the front door to the check-in office; after verifying their details, the agent will provide the combination to the lock box underneath with their late-arrival pack. Guests who arrive outside normal front desk hours are required to return to the office the following day by noon to complete the check-in procedure. Kids stay free! Up to 2 children under 18 years old stay free when using existing bedding.